Search For "E-Commerce & IT Outsourcing" Companies in Ocala, Florida - Click Here Now! We Clean Commercial And Residential 24/7. We're Reasonable And Reliable. We Are Now Offering Senior Discounts And Holiday Specials. We Do What A Lot Of Other Companies Won't - WINDOWS (For A Smal Extra Fee) Inside And Out!. 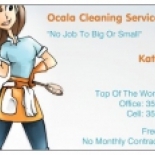 OCALA CLEANING SERVICE in Ocala is a company that specializes in Computer Related Services, Nec. Our records show it was established in Florida. (523) 013 301 352 789-7292 Call Now!